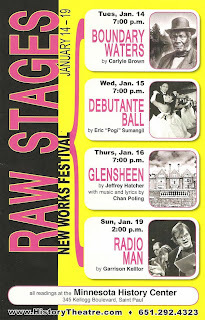 Last night I attended the first of four new works being presented by the History Theatre as part of their Raw Stages festival. On a bare stage with just a few chairs and music stands, actors read the play from the script. But with fine accomplished actors such as these, it becomes something more than just a reading, although not a fully staged production. In a reading with no visual stimulation, it's all about the words, and in this case they are beautiful descriptive words that paint a picture of a landscape and the people who inhabit it. Boundary Waters, written by Carlyle Brown and directed by Marion McClinton, uses a real-life event in Minnesota history as a metaphor for exploring several ideas. George Bonga was a fur trader of African-American and Native American descent living in Northern Minnesota in the 19th century who became a legendary figure. One of his more famous exploits was tracking down and capturing a suspected murderer, an Ojibwe man named Che-ga-wa-skung, who was then sent to trial at Fort Snelling. This event is at the center of the play as we learn how these events changed the two men and bonded them. The play opens in the late 1860s (post Civil War and US-Dakota War, both of which are referred to), when George Bonga (beautifully voiced by James A. Williams) is being haunted by dreams about the man he once tracked across the frozen Minnesota winter. He tells his wife (George Keller) the story, and the action flashes back to the chase in 1837. After capturing Che-ga-wa-skung (who, thanks to the writing and Jake Waid's talent in bringing him to life, becomes a sympathetic character despite being a murderer), the two have many deep discussions as they try to survive the cold. Che-ga-wa-skung asks Bonga a simple question, "who are you?" Bonga doesn't really have an answer, he's always living on the boundaries, the son of an Ojibwe mother and a black father, and living the "white ways" as a fur trader. Bonga struggles with the question until the two men meet again later in life and continue the discussion. Rounding out the cast are Jon Andrew Hegge as two colleagues of Bonga's, and Michael Terrell Brown in a too small role as Che-ga-wa-skung's brother. I very much enjoyed the reading of this new play; it's a fascinating exploration of a chapter of Minnesota history I was previously unfamiliar with, as seen through two well-drawn characters. That's not to say my mind didn't wander on occasion during the dense political sections, but for the most part the captivating and descriptive language held my attention and painted the world so well that I could almost see it. The lakes area north of Brainerd is one of my favorite places on the planet, where I've spent many peaceful and contemplative weeks. It's a thrill to hear that place come alive and to learn a bit more about the region's rich and complicated history. Most of all, I love getting a glimpse into the creative process of what it is to have an idea, write a play, and bring it to life. I look forward to the next incarnation of Boundary Waters. 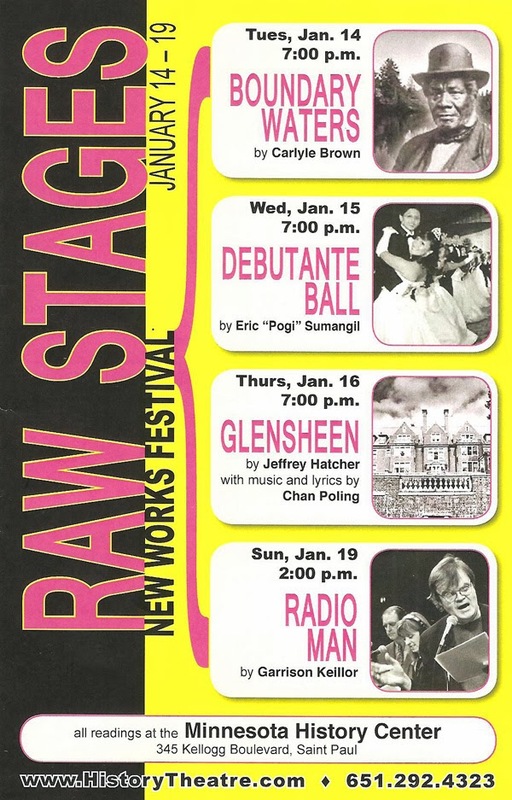 The History Theatre's Raw Stages festival continues at the Minnesota History Center tonight with Debutante Ball (about a Filipino-American Valentine's Day ball), followed by Glensheen (a musical retelling of the murder in the mansion) and Radio Man (a new play by one of my favorite Minnesotans, Garrison Keillor).